ORLANDO — Carrier Enterprise (CE), the leading provider of temperature and energy control technologies for commercial and residential properties, will be showcasing its comprehensive product lines at the upcoming 2013 Asian American Hotel Owners Association trade show in Houston. CE is featuring hospitality-specific HVAC and energy management solutions from its Gree, Founten and TopTech brands at the annual trade show, running March 27 to 28 at George R. Brown Convention Center. CE’s booth at AAHOA will feature the Gree Engineered Terminal Air Conditioner, or E-TAC. Designed to meet the rigorous demands of hotel temperature control, E-TAC’s smart technology puts energy regulation and savings back into hoteliers’ hands. Backed by the longest standard warranty in the industry, the E-TAC series offers a dry mode, pre-programmed setpoint limits and low energy consumption rates. E-TAC products are remote-controlled and wireless-compatible, and its aero-quiet fan with silencing technology makes it ideal for hotel guestrooms. A programmable sleep timer mode makes energy efficiency simple. 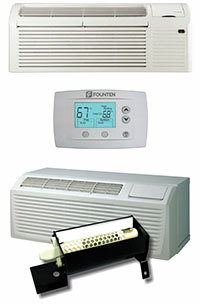 The Founten line of products delivers an affordable top-to-bottom HVAC energy management solution for hotels of all sizes. Employing wireless and Cloud computing technologies, Founten products bridge the price and capability gap between standalone programmable thermostats and direct digital control systems. Founten products, which feature integrated wireless networking capability to significantly reduce installation and configuration costs, include thermostats capable of automatically managing efficiency of all types of HVAC equipment. The system’s nerve center is the Cloud-based Founten Site Manager, which provides real-time management and control, continuous data tracking, complete analysis and reporting. Carrier Enterprise will also be showcasing their PTAC Air Knight air purification system at AAHOA. This unit enhances the guest experience by eliminating unhealthy indoor environments. It reduces odors, air pollutants, VOCs (chemical odors), smoke, mold, bacteria and viruses in both the air and on surfaces. Easily mounted in a variety of air conditioning systems, Air Knight is specifically designed for HVAC units utilized in hotels and healthcare facilities. The advanced oxidation process consists of friendly oxidizers that revert back to oxygen and hydrogen after sanitizing the pollutant. To schedule a demo of any of these products or to meet with a CE representative at the AAHOA trade show, contact Kristin Gallup at 407-375-2050 or email kristin.gallup@carrierenterprise.com. For further information, please visit www.carrierenterprise.com. Carrier Enterprise (CE) is a subsidiary of the largest independent HVAC/R distribution company in the world, Watsco, Inc. CE proudly distributes the Carrier, Bryant, Payne, Gree, TopTech and Founten brands of HVAC equipment, as well as a full line of aftermarket parts, supplies, and accessories. CE has more than 150 locations throughout the Americas, an expansive footprint that makes it easy to provide service and equipment anytime and anywhere. For more information, please visit www.carrierenterprise.com. ©1995-2013 Hospitality Net™ All rights reserved.